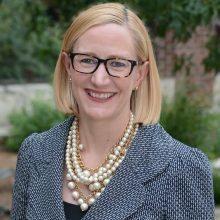 Holly Kuzmich serves as Executive Director of the George W. Bush Institute. She oversees the strategy and management of the Institute, an action-oriented policy organization that develops leaders, advances policy, and takes action to solve today’s most pressing challenges. The Institute’s work focuses on education reform, economic growth, human freedom and democracy, global health, military service, the women’s initiative, and the Presidential Leadership Scholars program. She leads the Bush Institute’s global health initiative on cervical cancer prevention and treatment and its partnership with the President’s Emergency Plan for AIDS Relief. Holly has over 20 years of public policy experience, serving in senior positions in the government, private, and non-profit sectors. She is a veteran of the White House, the U.S. Department of Education, and Capitol Hill, where she developed her expertise in education policy. She served President Bush for seven years as the Assistant Secretary for Legislation and Congressional Affairs and Deputy Chief of Staff at the U.S. Department of Education, and on the staff of the White House Domestic Policy Council. Prior to that, she worked for two United States Senators on domestic policy issues. A native of South Bend, Indiana, she received her Bachelor’s degree from Northwestern University.